This article was updated on March 15, 2009. Several readers have asked for a list of the best early retirement reference books. Here's twelve I've found extremely useful. By far the best book on the subject is Cashing in on the American Dream: Retire at 35, by Paul Terhorst. It's out of print, but you may be able to find a copy at your local library. The next two focus on saving money and adopting a thrifty lifestyle. The following seven offer insights on how to manage your retirement savings. The penultimate book by Professor Andrew Hacker provides invaluable career advice by answering the question "Money: Who has how much and why?" Finally, Robert Kiyosaki puts it all in perspective by telling us "What the Rich Teach Their Kids About Money That the Poor and the Middle Class Don't." Cashing in on the American Dream: Retire at 35. Click here to order Cashing in on the American Dream: Retire at 35 Today! This classic by former CPA Paul Terhorst is the bible of early retirement. Terhorst hung up the wingtips in 1984 with a nest egg of some $400,000. The investment advice is a little dated (No one would recommend a portfolio of 100% CDs today. ), but the advice on planning for early retirement is timeless. Adam Starchild has a good synopsis of the book on his Libertarian Web Site , click here. For those of you wondering what Paul Terhorst is doing today, 15 years after early retirement, you can visit his home page, click here. 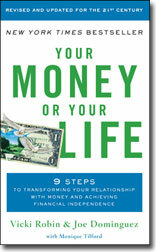 Transforming your Relationship with Money and Achieving Financial Independence. Penguin Books, New York, NY, 2008, 368 pp. Click here to order Your Money or Your Life Today! This is by far the best book I've seen on how to save money and live within (or below) your means. Both skills are necessary for early retirement. The first edition of Your Money or Your Life was roundly criticized for its investment advice (i.e., to put everything into long-term US Treasury securities), but the authors now outline a more balanced, more mainstream approach using low-cost index funds. Perhaps the most interesting part of the book begins on Page 56 with a discussion of "Tracking Your Life Energy." Despite the New Age terminology, this is a very sensible system for determining your "Cost of Working." For most people this is a real eye opener. Once you add up all the costs of working and include commuting and unpaid overtime in your hours worked, you may have a minimum wage job. Did you know there is a minimum daily requirement of work? Page 198 begins a fascinating review of the "Work through the Ages" and concludes that 15 hours per week is about all that's needed. That's right, three hours a day. Apparently even the cave men took Saturday and Sunday off. The notion that every one should have a 40 hour a week job began with the Industrial Revolution. No one seems to be taking credit for 1980's phenomenon that you work nights and weekends, too. In the last chapter on managing your finances, the authors' admit that their original advice to hold a 100% fixed income portfolio fell well short of the mark. (Some early adopters of this program have been negatively impacted by rapidly rising prices for basics like health care, housing, food and transportation. (p. 277)) Indeed, the $7,000/year that Joe Dominguez was drawing from his $100,000 US Treasury portfolio when he retired in 1969 would have needed to grow to $31,000/year by the time he died in 1997 to have the same spending power. No amount of composting or the washing and reusing of tin foil and wax paper could have ameliorated the inflation. We highlighted the story of one early retiree who maintained a 100% fixed income portfolio in the September 2006 article on Early Retirement Plan Failures. Longstreet Press, New York, NY, 1996, 258 pp. Click here to order The Millionaire Next Door Today! by Thomas J. Stanley, Ph.D.
Click here to order The Millionaire Mind Today! Two excellent books on who's wealthy and what it takes to get wealthy. Lots of examples, anecdotes, and folksy aphorisms. Presents formula for calculating how much wealth you're accumulating compared to other wealthy people. The authors make the important distinction between the truly wealthy and those that just spend a lot of money to look wealthy (i.e., those who are "all hat and no cattle.") Click here for excerpts from and comments on the best parts of the Millionaire Next Door. Hyperion, New York, NY, 1993, 272 pp. Click here to order The Great Boom Ahead Today! Although written in 1993, many of Harry Dent's economic predictions of the Great Boom have already come true. The central correlation of Dent's forecasts is the "44-46 Year Birth Lag." He believes that the performance of the economy is largely driven by the consumer spending of families headed by 44-46 year olds. As far back as 1955, this variable has closely tracked the S&P 500 Index adjusted for inflation. Using this analysis, Dent sees the current economic boom extending to the year 2008. When interpreting this plot, it's important to recognize that the Dow Jones average has been adjusted for inflation. For instance, in 1965 the Dow closed the year at 969.26. But when we add the effect of 30 years of inflation, the 1995 equivalent is 4677. Similarly, the 2008 Dow forecast of 14,000 was reduced by our inflation estimate. If the future plays out as predicted, the Dow Jones average reported in your newspaper will be somewhere between 18,000 and 20,000 in the year 2008. How to Achieve Personal and Financial Success in the Greatest Boom in History. Simon and Schuster, New York, NY, 1998, 288 pp. Click here to order The Roaring 2000's Today! Harry Dent's update on The Great Boom Ahead. As before, he predicts the boom will last to 2008, but he now forecasts a Dow as high as 35,000. Dent advises selling real estate and stocks in 2006 and putting the money into US Treasury bonds. Great advice if his predictions of deflation and a 15 year recession starting in 2008 are correct. The last chapter of the book "Seven Principles of Successful Investing" breaks down on one important point. Principle Six - find an objective financial advisor and pay him a fee of 1% of assets to tell you how to invest. At least 85% of advisors under perform the market so most investors would do better buying an index fund and saving the 1% advisory fee. Mr. Dent should be excused for this lapse since he discloses on page 304 that he runs a thriving business conducting seminars for financial advisors and institutional investors. We can't expect him to suggest his readers avoid doing business with his clients. The Roaring 2000's Investor: Strategies for the Life You Want. by Harry S. Dent, Jr.
Simon & Schuster, 1st Edition 1999, 239 pp. Click here to order The Roaring 2000's Investor. Today! If you've read the previous two books, you can skip this one. For the complete Retire Early review published on November 1, 1999, click here. Click here to order Deflation Today! This is the best book I've seen that explains what happens in a deflationary environment. Very few people alive in America today have experienced real deflation, since the last time it appeared was during the Great Depression. Like aging admirals, we're still trying to fight the last war against INFLATION, even though the new threat may be very different. While this isn't the upbeat forecast of Harry Dent's The Great Boom Ahead, Gary Shilling sees a delationary environment much like the post Civil War period of the late 1800's. This should be survivable for most people. The History of America's Future, 1584-2069. William Morrow & Co., New York, NY, 1992, 538 pp. Click here to order Generations Today! Demographic source material for Harry Dent's The Great Boom Ahead and The Roaring 2000's. A detailed analysis of how new generations drive culture, politics, and the economy. Required reading for those intrigued by Dent's "Great Boom" hypothesis. The Definitive Guide to Financial Market Returns and Long-Term Investment Strategies. McGraw-Hill, New York, NY, 1998, 302 pp. Click here to order Stocks for the Long Run Today! Excellent overview of why stocks are the best investment if your time horizon is more than 10 years. The author does a great job describing the historical returns for the stock and bond markets over the past 110 years. He also explains the risks of investment including the often overlooked concept of agency costs (Page 77). Agency costs are the diminished returns shareholders receive because management often has goals that conflict with shareholder's interests. For example the CEO of a company may decided to buy a larger corporate jet, or your fund manager may decide to increase the fees and commissions on your mutual fund. Neither of these actions are likely to benefit shareholders. The Previously Unexplained Techniques That Have Made Warren Buffett the World's Most Famous Investor. Simon and Schuster, New York, NY, 1997, 320 pp. Click here to order Buffettology Today! Warren Buffett is the second richest American after Microsoft's Bill Gates. This volume, written by his former daughter-in-law, outlines Buffett's approach to securities valuation. It offers invaluable tips that any investor can use in building his own portfolio. (Example: Buffett looks for companies where management operates the firm in a way that maximizes shareholder value. This reduces the agency costs described by Professor Siegel) The second half of this book contains some math. Readers may want to buy a financial calculator if they don't already have one to work through some of the examples. Who has how much and why. Simon and Schuster, New York, NY, 1998, 256 pp. Click here to order Money Today! There's a certain amount of chance involved in determining one's economic prospects. The hardest working or the smartest don't always make the most money. Since you're going to need a large wad of money if your going to retire early, it's instructive to learn which occupations offer the greatest chance of accumulating your wad. This book is full of fascinating statistics. For instance, on Page 80 we learn that the average person with a $1 million annual income earns only $322,057 in wages and salary. Much of the remainder is interest, dividends, and capital gains. No wonder Steve Forbes wants to eliminate the tax on investment income. In Chapter 7, Hacker tells us that the most highly paid lawyers make much more than the highest paid doctors. An attorney can get up to 40% of a multi-million dollar judgement, while a surgeon, no matter how talented, can only charge so much for an operation. "The bulk of formal schooling consists of sustained sitting....How is this experience a preparation for later life? The first answer is that school makes youngsters sit at a time they would prefer doing just about anything else. In a word, school accustoms you to being in a place you would rather not be." Right on Professor Hacker! What the Rich Teach Their Kids About Money That the Poor & Middle Class Don't. Techpress, Inc., 1st Edition March 1999, 184 pp. Click here to order Rich Dad, Poor Dad. Today! Working hard and getting a good education has been part of the American forklore for quite some time. Most parents stress this theme. Unfortunately, economic rewards don't always flow to the "brightest" or "hardest working." The problem is financial literacy. It's only rarely taught in school and many parents don't know enough about the subject to discuss it with their children at the dinner table. (Surprisingly, there are even graduates of well know business schools that are clueless on the subject.) Author Robert Kiyosaki address the problem in depth in Rich Dad, Poor Dad: What the Rich Teach Their Kids About Money That the Poor & Middle Class Don't. It's among the most entertaining books available on the subject. For the complete Retire Early review published on December 1, 1999, click here. There is also an excellent review by John T. Reed that rebuts many of Kiyosaki's points. It's well worth reading. Copyright � 1999 John P. Greaney, All rights reserved.